People who are looking to lose large amounts of weight -- 60 or more pounds -- must look beyond fad diets and short-term workout plans. To lose more than just a couple of pounds, you'll need to implement a more concerted and long-term effort. Setting realistic goals for how long it will take to lose the pounds is one of the most essential aspects of losing large amounts of weight. Making the commitment to work hard and lose the weight is always the first step. Once you've arrived at the decision, the only thing holding you back is how hard you want to work. Unfortunately, some people put their health at risk in a desire to lose large amounts of weight too quickly. 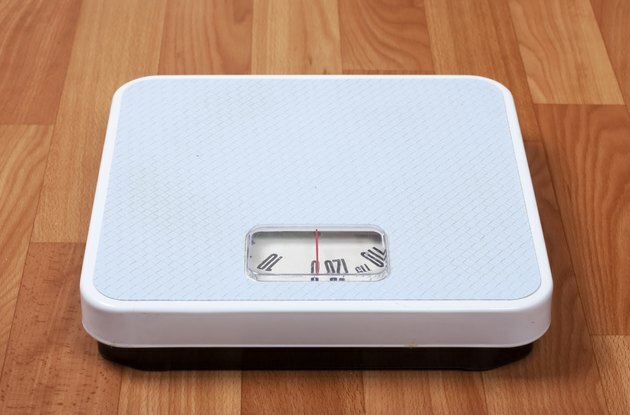 According to MedlinePlus, a safe rate of weight loss is between 1 to 2 lbs. per week. Losing more weight than this on a regular basis can put you at risk for serious medical conditions, such as malnutrition, the development of gallstones and even irregular heartbeat, according to the National Institutes of Health. Once you understand a safe rate of losing weight, you can set realistic goals for your long-term and short-term weight loss. If you're trying to lose 60 lbs., a maximum rate of 2 lbs. per week means you would need 30 weeks to lose all your weight. You may want to adjust your goal slightly to factor in "off" weeks in which you lose less weight than you expect and fail to meet your weekly goals. Setting realistic goals helps you avoid frustration and disappointment that can sometimes lead to completely abandoning your weight-loss efforts. Weight loss is simple math. You can use this to your advantage in planning out your meals and exercise to help predict how much weight you'll lose. Since it takes a calorie burn of 3,500 calories to lose 1 lb., creating a calorie deficit of between 500 to 1,000 calories every day will help you consistently lose between 1 to 2 lbs. per week. You can create this deficit by combining a calorie-reducing diet with regular exercise. Reaching a significant weight-loss milestone is a big deal. But sometimes the hardest challenge is keeping the weight off. Even after you've lost 60 lbs., keep monitoring the calories you consume each day and the amount of calories you burn through exercise. Indulge a little more in the foods you love now that you're at your ideal weight, but avoid going back to the overeating habits from before you lost the weight.